Discover a completely immersive and fun learning experience with the Virtual-Tee, an Augmented Reality T shirt from Curiscope's which teaches you about the human body... on a human body. The Virtuali-Tee uses beautifully designed technology and amazing 3D learning experiences to explore the circulatory, respiratory and digestive systems. Anatomy expert, Hans Glover, can be summoned at the tap of a finger to guide you through each system. 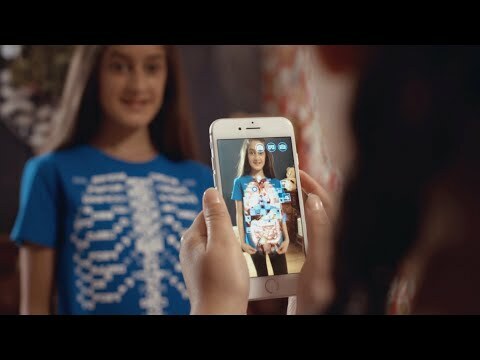 Simply download the FREE app from the App Store or Google Play, put on your Virtuali-Tee, get a friend to wear it or even pop it on a skeleton! Once the app has scanned the Virtuali-Tee tap anywhere on the screen to peel back the layers of the body and interact with the different systems and organs by clicking on the hotspots. The app works in selfie mode so you can even use the front camera to explore the internal systems on yourself!